The EZ Mower Care winter service program is the best deal of year to keep your lawn equipment operating properly. This service is only available over the winter months so you will beat the spring rush that we experience in the spring. Regular service will also extend the life of your equipment so you'll always bel be ready to mow. We encourage you to sign up early to avoid pickup or delivery delays due to snow cover. You must pre-schedule by Jan 31. We begin early pickups in Nov and continue until all signups are picked up. Download the flye r for all the details and pricing. EZ Mower Care service is a great way to keep your mowing equipment in good working order. It's quick, easy, affordable, and GUARANTEED. 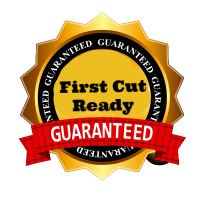 Aberdeen Outdoor Power is the only shop we know of that offers a First Cut Ready Guarantee! Simply put, Let us service your mower this winter and we'll guarantee that it will be ready when the 1st Spring cut is needed.